Merry Christmas and a happy new year! It's that time of year where we are scrambling between buying and wrapping presents, trying to look cute for holiday photos and figuring out how to cook something for 8-20 people. It's like I am never ready for this even though I know when it's coming every year. So I have my tried and true recipe that feeds 20 people or feeds 8 people with left overs for a killer sandwich. My mom's parents were super old school Hispanics and I had lived with them for most of my childhood. This wasn't something we only ate on Christmas, it was something we ate every two months. As my grandma got older, I became more in charge of this, until she wasn't around anymore. I'm now the only female left in my family that knows how to make this. With my eyes closed might I add. I promise it's easy. It's a little time consuming but not worse than turkey is. 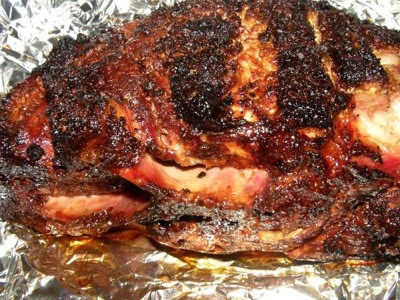 You will be eating something amazing and be able to make one hell of a Cuban sandwich the next day that will also make you locally famous. Or at least something your family begs you to make for all the next social gatherings! Keep in mind you will need two days to do this. The first day is for prep and marinade where it will stay all day in it's roasting pan covered. The next day is for cooking. You will need to cook it 30-45 minutes per pound. So a 6lb pork should will take 4.5 hours. 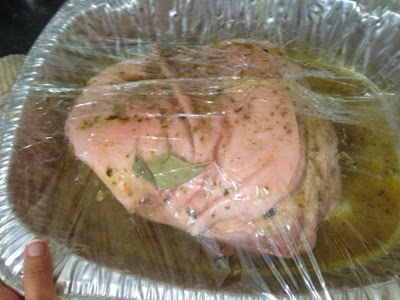 So here we go, pernil aka pork roast a lo caribbeño. 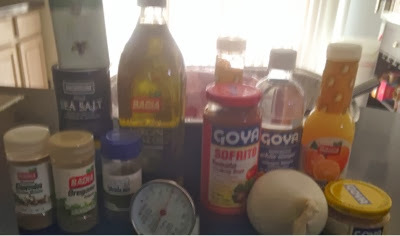 Set aside some of garlic, all the onions and sofrito. 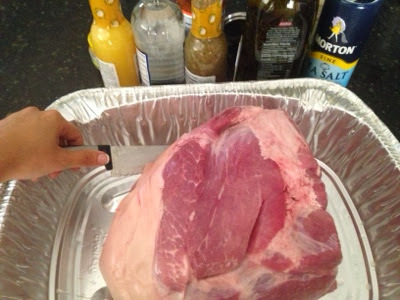 Take your pork shoulder and run it under cold water, then pat it try. Put it in the roasting pan (disposable is fine). Now you want to take a pretty decent sized knife and make slits all over it. About 1 inch wide and 2 inches deep should be good. There is no rhyme or reason to the pattern of the slits, just go. Make 20 -30. With a teaspoon or a turkey baster, you are going to take some of the green sofrito and fill the slits with it. Place a little bit of extra garlic into each of the slits whether its minced or a whole clove. When you fill it all up you are going to take the marinade and rub it all over the pork shoulder. Cut up your onion into thin round slices. This will go on the pork later on. Now we are going to put plastic wrap over the top and let it sit in the refrigerator until tomorrow. Make sure you have enough room in the fridge before any of this. The next day, take it out of the fridge one hour before cooking. Make sure you do not need the over for the next 4 - 8 hours depending on how big your shoulder is. Put two cups of water in the roasting pan. Cover it with foil or the top of the roasting pan. After two hours of cooking, uncover it and baste it with the juices. KEEP IT UNCOVERED AND ADD THE SLICED ONIONS ON TOP. I just take a big spoon and pour it over the shoulder. Then every 30 minutes go back and baste it until the cooking time is over. When the cooking time is done take your thermometer and place it deep in the shoulder without touching the bone. The juices should run clear and it should say 185 - 195 degrees. 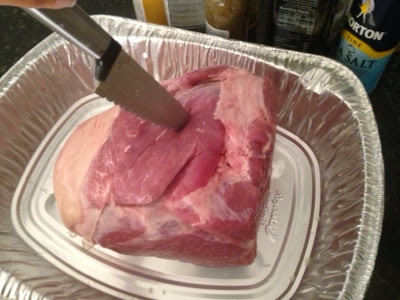 Let it rest at least 15 minutes before cutting it up and serving. 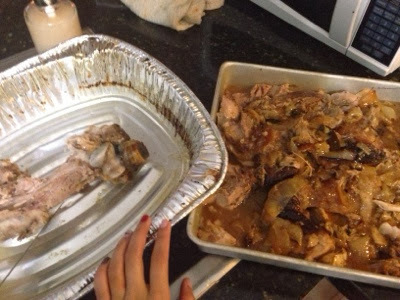 If you have left over marinade you can leave some in a little gravy dish with your roasted onions for those who might like a wetter textured pernil. I promise this is fool proof. I just set a timer every half hour on my iPhone and do other things like get the house ready and do my hair, nails and make up. It will be a hit. I hope you had a great year.